The following needle felting workshop projects can be scheduled for individuals or private groups. Discounts available for groups and multi-day events. learn how to needle felt fully jointed needle felted dolls! Master the art of needle felted doll making! In this three part series, you’ll get one-on-one instruction as you and I sit down and make needle felted dolls together. You will learn the skills you need to master the art of needle felted doll-making. You’ll learn to create fully jointed dolls that stand, bend and flex with a realistic range of motion, without the use of wire or armatures. You’ll discover the magic of needle felting faces while learning techniques to create expression and character. You’ll learn how fun and easy it is to get your doll dressed while mastering some amazing needle felting techniques. From wherever you are at in your needle felting skill levels, I’ll guide you along and offer you assistance, advice and insight as we create our dolls together. In my studio, we’ll be in the company of my collection of needle felted characters that love to join in to help show you the possibilities. Needle felting classes at Felt Alive are a whole lot of fun! This advanced doll making class is comprised of three, individual six-hour long sessions by appointment and can be scheduled at your convenience. Call Kay at 541-592-3499 for more information or to reserve your dates. Learn easy techniques for needle felting faces with character and charm! Sign up for all three sessions and the third one is free! 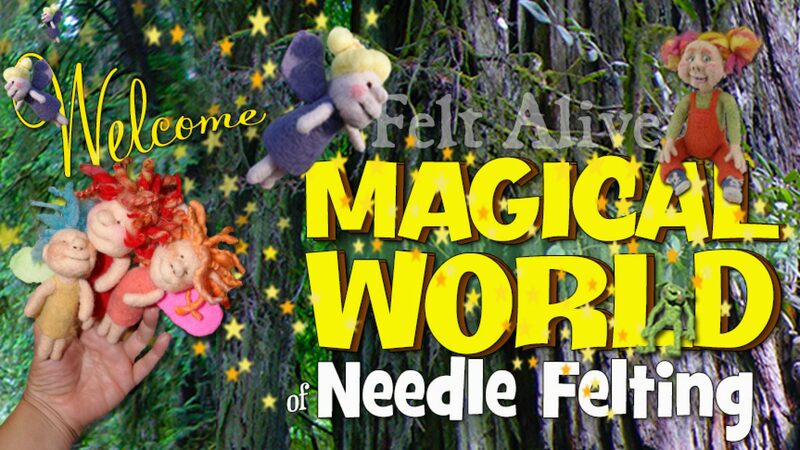 Make sturdy, fully jointed needle felted bodies that stand alone without the use of wire armatures! No-sew needle felting techniques for getting your doll dressed and finishing your creation. Sign up for all three Advanced Doll Making sessions and get the third session Free! These fun workshops give you an action packed day of fun and learning. You’ll learn so many techniques that you will be able to use to bring anything you can imagine to life in wool! Besides making an adorable little buddy, fully jointed bodies without the use of wire armatures is the highlight of this class. Sign up for all three sessions and get the third session FREE! Make a new best friend! We don't use wire armatures so your pup will be free to spring and jump nearly like he's alive! In this fun workhsop you'll learn advanced techniques for faces. Needle felting the eyes and teeth is amazingly fun! These three workshops are so fun and easy – even for a complete beginner. With just a few simple techniques, the wool will be smiling at you and you’ll be hooked on needle felting forever! The moment the wool smiles at you, you'll be hooked on needle felting forever! These sweet little fairies will magiclally flutter on your fingertips! Mushrooms, Bugs and Worms to brighten your world!